You can use a Bosu Ball to perform many killer ab exercises! I think the Bosu Ball is a great tool for ab exercises and core exercises. Because the Bosu Ball is unstable, your abdominals and core muscles will work harder, and you'll have improved balance, coordination, and core strength. 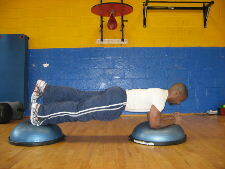 Below is a more challenging version of the plank using 2 Bosu Balls to fire up your core muscles. If you are a beginner try mastering the regular plank first, and try this one after you've built up your core strength. Starting Position: Begin by placing your hands on top of the Bosu Ball and also place your feet on top of a Bosu Ball. Keep your body in a straight line and engage your abs and core muscles. 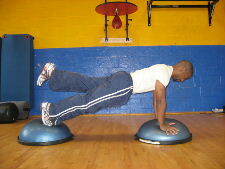 Then progress by using 1 Bosu Ball for planks. Once you master 1 Bosu Ball, then try using 2 at the same time. Lastly, visit the Picture Directory of Abdominal Exercises to learn more killer ab exercises and core exercises or try one of the free ab workouts.